Top 5 London Wedding Dress Suppliers. Last week was mine and Peter’s 5 year wedding anniversary. The anniversary brought back lots of fun memories of the day and the lead up to the day. My dress shopping experience was quite unplanned – I bought my dress in a sample sale in San Francisco while Peter and I were on a road trip of California, (But that’s another blog!) The anniversary got me thinking if I was a bride-to-be getting married this Summer which wedding dress designers would I use? Here are my top 5 London based wedding dress suppliers. I met Charlie a couple of years ago at a friends party, we had both just had our first kids at this point and they were a couple of months apart in age. By coincidence we had both had the same maternity nurse so had a quick, “You’re a wedding dress designer/you’re a milliner chat” and then “Have you started baby weaning yet?!! !” I googled Charlie later and loved her vintage wedding dresses. She has since branched out into ready-to-wear as well as made-to-order dresses and a very lovely collection of jewellery. Charlie says of her vintage dresses, “The appeal of wearing a vintage wedding dress is that you will own a stunning gown that is completely unique. Our brides often remark that they have never seen a wedding dress like the one they buy. Vintage dresses break away from the mould of ‘The traditional wedding dress”. This gorgeous boutique is situated in North London around the corner from my house! As well as their award winning bridal wear, they also sell some amazing ready-to-wear collections. I love these colour ways, imagine getting married in fuchsia – gorgeous. This label is so cool and so London, just like the two girls running the show, Alice and Hannah who studied at London College of Fashion. Their shop is on Brecknock Road, take a look and while you’re there pop to Salvino’s, the shop next door for some fantastic Italian food. Although if you want a Belle & Bunty dress it might be a good idea to stear clear of the freshly made pasta! OMG, I love Doris Designs…..really, really love it. If I was getting married again I’d go to these guys and buy a petticoat for myself, my three year old, my baby and my bridesmaids! In fact I’m going to buy one for myself and my daughters anyway! These are THE petticoats, of all the petticoats in the world, these are the ones you want. Just buy a cream one and team it with a cream vest top and that’s it, go get married! They are based in Surrey and see people by appointment only, but they do have an online shop which makes things easy. They have masses of colours and are made of 36 meters of double layered soft light chiffon. Please check them out, I love them! I’ve met the lovely ladies from Candy several times over the years at various wedding shows around London. Let me tell you they are as gorgeous as the dresses they create. If I could I’d have a different colour Candy Anthony dress for every day of the week! If you’re into the trend for 50’s style dresses you have got to check out their little shop under the Oxo Tower. All the dresses are that classic 50’s shape that gives you the nipped-in waist look perfectly. 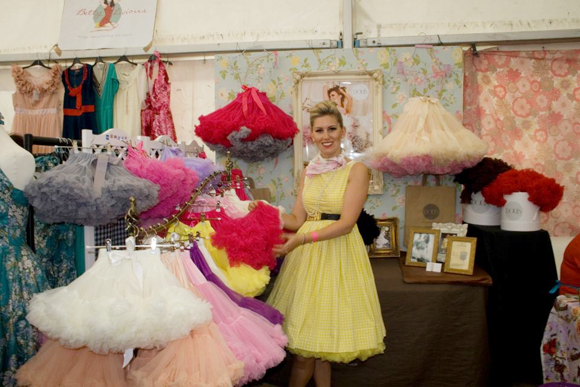 But by playing with different overlays (polka dot, vintage lace or tulle) and petticoats (blue! purple!) they’re easy to customise and feel really fun. The name of this wedding dress shop says it all – it’s got attitude. Set up by Laura and Emma, two former film costume supervisors with a penchant for finding vintage dresses, it’s packed with original pieces spanning the century and some vintage-inspired dresses cut from their most popular shapes. If you’re looking for something really stand-out this is your place. You may be a bit surprised to see Oxfam on my list but I’m a big believer in helping out and saving money! Oxfam’s Online Shop has a beautiful range of second-hand wedding dresses and one-off pieces for the groom, best man and bridesmaids. Oxfam also has eleven bridal departments across the UK offering specialist advice and dresses at fantastic prices. Many dresses are donated by designers, so you can buy the wedding dress of your dreams for much less than you would expect, while helping to support Oxfam’s wonderful work. The website is super cute – I promise you’ll be surprised. So there it is, my top 5 go to gorgeous wedding dress suppliers. I hope you have fun wandering through their websites. I’ll be doing a series of blogs on wedding suppliers over the next couple of weeks and re-living my lovely day. I’ll also be giving a few tips on how to have the most fun and least stress on your day.